Ninety-eight of the parliament’s 131 members voted in favor of the bill, with nine voting against it and five abstaining. 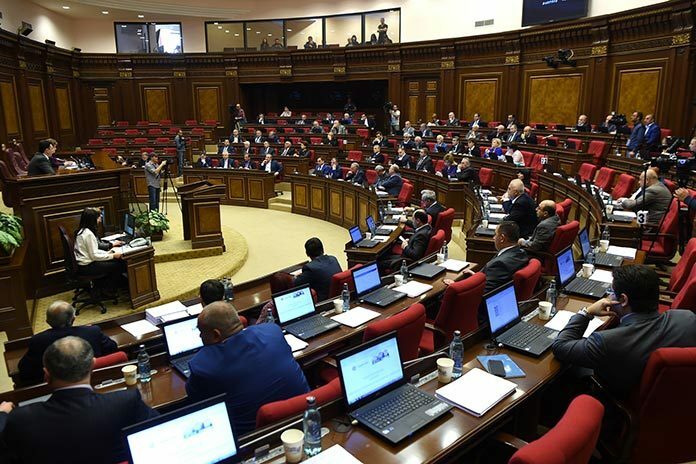 Those who voted against the bill were MPs Edmon Marukyan, Vartan Oskanian and Tigran Urikhanyan, the opposition Heritage faction’s Zaruhi Postanjyan and five of the six members of the opposition Armenian National Congress (ANC) faction. One ANC faction member, Lyudmila Sargsyan, voted in favor of the bill. The Orinats Yerkir (Armenian Revival) party did not participate in the voting. MP Elinar Vardanyan, who abstained during the vote, said that there is a “zero level” of public trust in elections and it should be the objective of the Electoral Code to address this matter. “The Electoral Code should define mechanisms that would allow avoiding frustration after another election over a rigged vote. But this system makes it possible to repeat all the fraud that existed under the majoritarian system [ed: mixed, proportional and majoritarian]. This system enables tough neighborhood guys to become members of parliament,” she said. Deputy Parliament Speaker Hermine Naghdalyan, who represents the RPA, urged her opposition colleagues to “change” themselves. “Now we say that the Electoral Code is based on mechanisms that do not allow fraud. Many people think they know where the problem lies. People, take off your suspicions out of you, it is this suspicion that does not allow you to judge calmly and see what there is in it really. Once again I get the impression that the opposition from the very beginning is getting ready for a defeat in elections and is creating a basis to blame the authorities,” she said. Before the vote Parliament Speaker Galust Sahakyan did not give any lawmaker an opportunity to speak on the procedural matters, which, according to the opposition, was a gross violation of the National Assembly regulations. “This vote took place with a gross violation of the regulations… This already shows that this law cannot be considered legitimate,” ANC faction leader Levon Zurabyan claimed after the vote. Deputy Parliament Speaker Naghdalyan dismissed the claim. “Ninety-eight people voted in favor of the bill. What violation are you talking about?” she said.